Dickson and high school pals celebrate their 60th year by taking a beat-up houseboat 400 river miles across Louisiana, testing its mettle and their own. They rediscover the magnificence of Louisiana’s waterways, the serenity of its sandbars, and the lure of its storied blue catfish. Everywhere they go, Dickson hears the echo of his great-great-great-grandfather, who journeyed up the same rivers 160 years ago. Proceeds from the book benefit The Nature Conservancy of Louisiana. 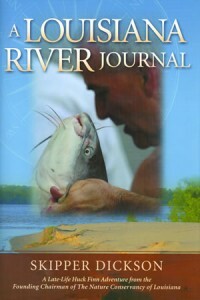 www.ALouisianaRiverJournal.com. Printed by Southwest Printers, 2010.